This is the first edition of many that showcases the latest widgets that have come fresh from production – allowing you to easily create powerful, smart and intuitive forms. Widgets are small applications that run independently on your form, allowing you to collect and manage your form information in better, faster and in efficient ways. Please visit our Widget Gallery, search for the widget you need, check out the widgets in action on our demos and please leave a comment – we would love to hear from you! 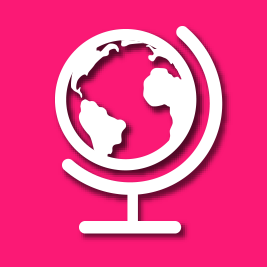 This widget has the capability of listing all the Cities and States that exist in the world. Its easy to configure, and makes it easy to filter down the list by country, state, then city. 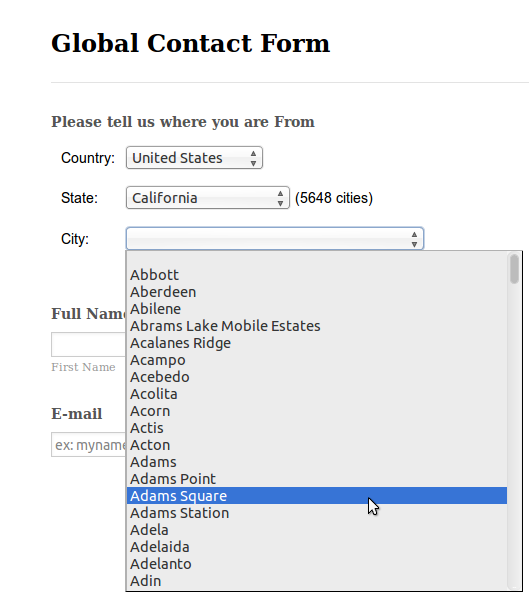 All states and cities can be used to on survey forms, International applications, product orders, helping you manage your form responses by locations. Go ahead and give the widget a try by clicking here. You can now link a series of dropdown boxes that automatically change available options depending on what is selected previously. 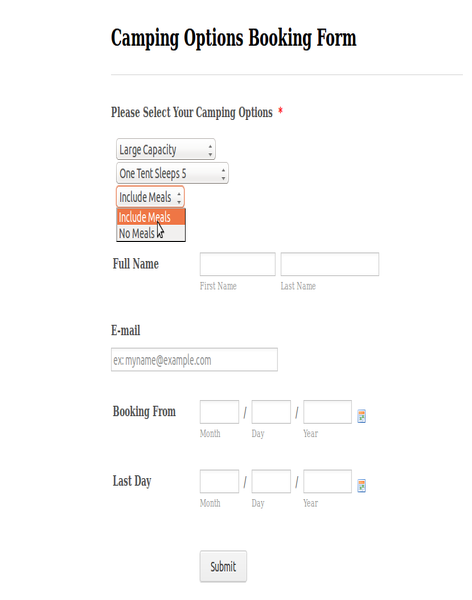 For example, on a booking form, each ticket comes with different privileges. When a certain ticket is selected - the options in consecutive dropdown boxes changes to reflect the options available for that ticket. Give the widget a try by clicking here. 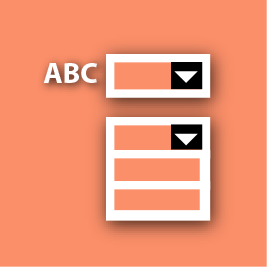 If you have options that can be layed out on a grid, your form users can select each option by clicking a cell on a grid. For example, you can present a simple calendar to your users who can select when they can come to your office for an interview. Click here to add it to your form. Now you can stop spamming on your form by adding a fun and foolproof captcha on your form. This widget loads simple and easy games that your form users have to complete before they can submit the form. This widget makes it easier to present variables to your form users so that the result can be accurately calculated. The variables can be anything from product options, quantities, product specifications among many others. 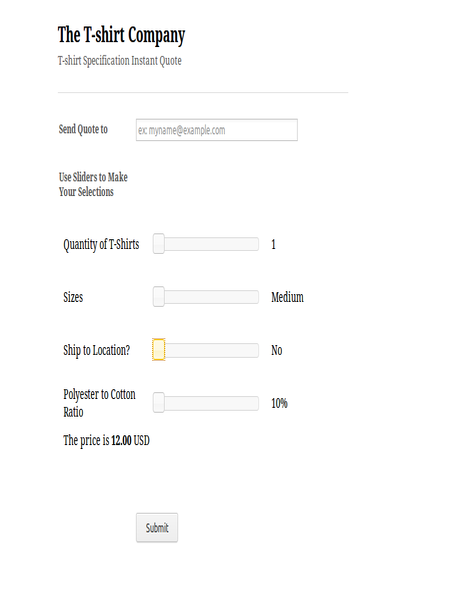 A good example would be selecting the properties you would want for a custom order T-shirt - and depending on the calculation you have configured on the widget - you can present an instant quote for your prospective customers. That's all for this week's edition - see you next week with the latest from Widget News! Dynamic Fields is THE PERFECT addition that I never requested!!!! Whoever came up with this deserves a week vacation in bahamas... Aytekin, your men and women are fricking GENIUS!